320 pages - 27.5 x 35.5 cm / 10.8 x 14 in. This book features Karl Lagerfeld’s most beautiful photographs of Haute Couture garments shot for French fashion magazine Numéro, to celebrate its fifteen years of collaboration with the famous fashion designer. Who else but Karl Lagerfeld could better reveal the timeless and intricate beauty of Haute Couture? 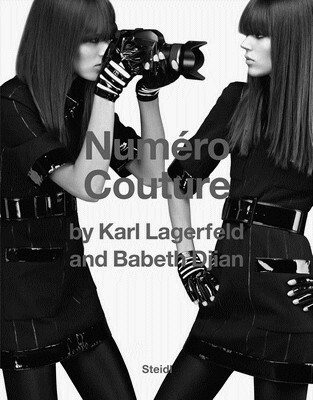 With all his innate imagination and indulgence, Karl Lagerfeld has immortalized the iconic models of our time within the covers of Numéro—Cara Delevingne, Linda Evangelista, Natasha Poly, Anja Rubik, Lara Stone, Stella Tennant, Natalia Vodianova… all these and more have participated in his game, often framed by sumptuous decors worthy of the greatest Hollywood productions. Karl Lagerfeld’s spectacular stagings visualize our most daring fantasies of female archetypes, from fairytale princesses to contemporary muses. KARL LAGERFELD, fashion designer, publisher and book dealer, began working as a photographer in 1987. Lagerfeld has since received the Lucky Strike Design Award from the Raymond Loewy Foundation, the cultural prize from the German Photographic Society, and the ICP Trustees Award from the International Center of Photography. Steidl has published most of Karl Lagerfeld’s books, including A Portrait of Dorian Gray (2004), Room Service (2006), The Beauty of Violence (2010) and the best-selling The Little Black Jacket (2012). Expo Ben @ Musée Maillol, Paris : Tout est art ?